Briggs and Stratton Manuals: Jacks is your Place! We have the Manuals you need, with fast shipping and great prices! For lawn mower parts and accessories, think Jacks! This Briggs and Stratton Engine manual covers all Intek V-twin (2) cylinder OVER HEAD VALVE. BRIGGS & STRATTON : Model Series 405700, 406700, and 407700. This manual covers all single cylinder side valve engines to date. It contains all spec's and repair detail. These engines only have 1 spark plug, located 90 degrees. They do not have overhead valves. This manual covers all V-twin (2) cylinder Vanguard OVER HEAD VALVE engines to date. This manual covers Vanguard single cylinder Briggs and Stratton OVER HEAD VALVE engines to date. This engine series has 1 spark plug angled at about 45 degrees. This manual covers all two cylinder side valve Briggs and Stratton engines to date. It contains all spec's and repair detail. These engines have two spark plugs. Engine model number is in the 400000 range. Repairman's handbook for Cast Iron Models A's-ZZ's, 5's-320000's and Aluminum Models 6B's, 8B's and 60000's-253400's. 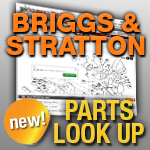 BRIGGS & STRATTON : Models A's-ZZ's, 5's-320000's and Aluminum Models 6B's, 8B's and 60000's-253400's.